While doing research for our trip to Kruger National Park, I noticed that locals seemed to always recommend visiting Hluhluwe-Imfolozi Game Reserve in Kwa-Zulu Natal instead. Since I know better than to argue with a local, I decided to follow their advice. While I couldn’t make Hluhluwe fit into my itinerary on our first road trip across South Africa, I made it a priority on our recent two week South Africa trip. We spent two nights in Hluhluwe-Imfolozi but I wish we had spent three nights. While most people visit this small KZN game reserve as a day trip from St. Lucia, I recommend staying for a minimum of 2 nights inside the park. It may be smaller than Kruger, but 96,000 hectares is a lot of ground to cover. Hluhluwe-Imfolozi, formerly known as the Hluhluwe–Umfolozi Game Reserve, is located in the Kwa-Zulu Natal province, on the Eastern coast of South Africa. Fly to Duban: The closest big city is Durban, 280 kilometers (170 miles) south. If you choose to fly into Durban, it's a 2 and a half hour drive to get to Hluhluwe-Imfolozi. Compare airlines, dates and prices for flights here. From Richard's Bay: If your flight into South Africa lands in Johannesburg, book a cheap flight to Richard's Bay. Thie smaller city is only 75 kilometers to the south and the drive is only one hour. Check flights here. Rent a car: Regardless of where your flight lands. rent a car. Car rentals in South Africa are the cheapeast I've ever seen. We rented one for a 30 days for $400 US and recently spend $200 for 16 days. It is the best way to see the country and self-drive safaris are ideal in the game parks. Check rental car rates here. 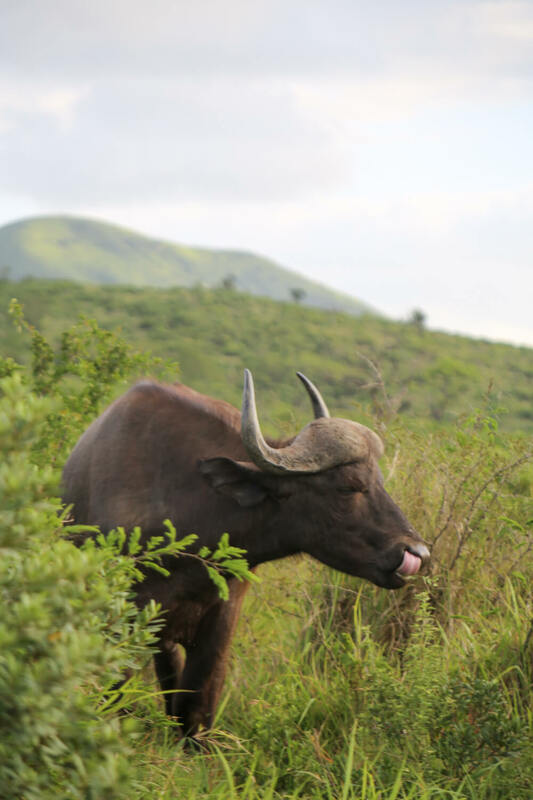 Day Trip from St. Lucia: The most common way to go on a guided game drive in Hluhluwe is as a day trip from the nearby town of St. Lucia on the coast. It's only thirty minutes away and is a hub for tourism in the area. 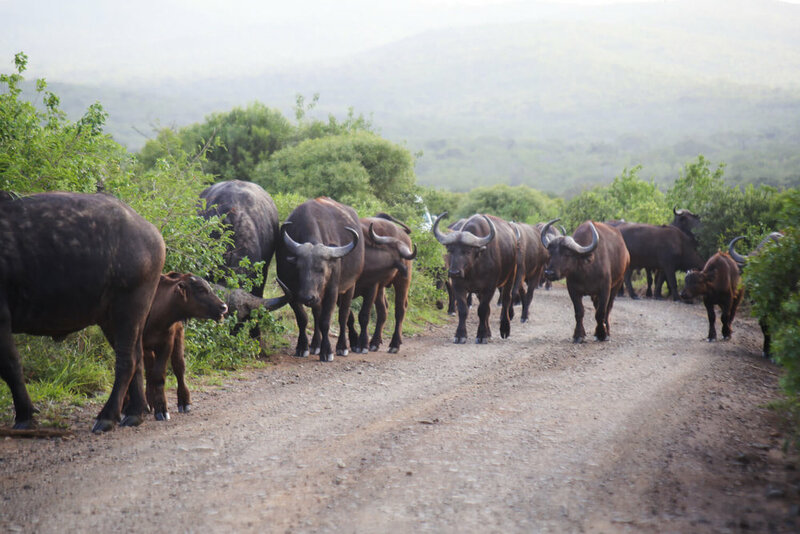 A number of companies offer half-day and full-day game drives to Hluhluwe-Imfolozi. Book your day trip here. Hluhluwe-Imfolozi Park is divided into two parts, Hluhluwe to the north and Imfolozi (formerly Umfolozi) to the south. Your entrance and conservation fees include both sections of the park and there is no gate or barrier dividing the two. Imfolozi in the south is bordered by Black Imfolozi river to the north and the White Imfolozi river to the south. There are more grasslands and savanna in Imfolozi with some steep hills and valleys in the river’s lowlands. Hluhluwe is the northern portion and is characterized by rolling hills and high ridges. It’s much more rugged and mountainous in this section of the park. We spent more of our day in the south and the reason I wish we had an extra day was so we could spend more time in Hluhluwe. I found the landscape here to be stunning and the hilltops were very windy and a welcome relief from the hot sun. Buy a map when you enter the park or in the Curios shops for 5 rand. The maps mark watering holes, hides and make sure you don’t keep going in circles. Cengeni Gate is the southernmost gate in Imfolozi. Nyalazi Gate is also in Imfolozi but is located in the center, where two parks meet. This is the gate to take if you’re coming or going from St. Lucia. Memorial Gate is the northernmost gate in Hhuhluwe. Hluhluwe-Umfolozi Game Reserve (as it was previously named) was founded to protect the world’s few remaining white rhino. This park brought the animal back from the brink of extinction. Hluhluwe-Imfolozi is still the main source for rhinos for private game reserves, zoos and game parks around the world. To fully appreciate this parks world-renowned white rhino conservation program, visit the Centenary Capture Centre. Unfortunately for us it was being remodeled and we couldn’t see it. Hluhluwe-Imfolozi is the best place in South Africa to see rhinos. I even lost count of how many we spotted. Nevertheless, poaching is still a major threat to both black and white rhinos, even in this sanctuary. A highway cuts straight through the park, allowing easy access to those with ill-intentions. We stayed the night in Imfolozi’s Mpila camp, so we were able to roll out of bed and be in our cars when the gates opened at 5:30. Since we only had one day in Hluhluwe-Imfolozi, we wanted to squeeze the most out our short time. It’s also important to leave early before the sun gets too strong. This area of South Africa is very hot and very humid. The animals will be less active in the hot afternoons. We spent our entire morning driving every path and road possible in the southern Imfolozi section of the park. I did get a little frustrated at first by the thick bush making it hard to spot game, but as we got further south it began to open up. I lost count of the white rhinos we saw (this park is the birthplace is rhino conservation and it shows!). My favorite parts of Imfolozi were the two hides, Bhejane Hide and Mphafa Hide. When we pulled up to our first hide (entrance above), a guide told me to hurry up if I wanted to catch a family of elephants playing in the water. I darted off, leaving Martin behind to eat his sandwich. He was taking an awfully long time, much longer than it takes to eat a ham sandwich I thought. Two wildebeest had walked up and trapped him in the car! When he tried to get out they let it be known he was not welcome. Crazy experiences like this were a reminder that even though you’re in a national park, you’re very much in the wild. It’s important to respect the wildlife, since we are the visitors in their home here. When in doubt, stay in the car and finish your ham sandwich and don’t anger the wildebeest. We returned to our campsite in Mpila for lunch and a bit of rest. We had sandwiches and my favorite salt and vinegar chips for lunch. A warthog snorted around looking for any braai leftovers that may have fallen off the picnic tables. We spent the rest of our day driving as much of the northern portion of the park as possible with our limited time. This is where a second day would have come in handy. We only saw part of the Hluhluwe Park even though we stayed out until literally three minutes before the gates closed. I really, really loved this part of the park. I fell in love with the rolling hills and the panoramic views. We stopped by the Hilltop Camp out of curiosity and need for WiFi. 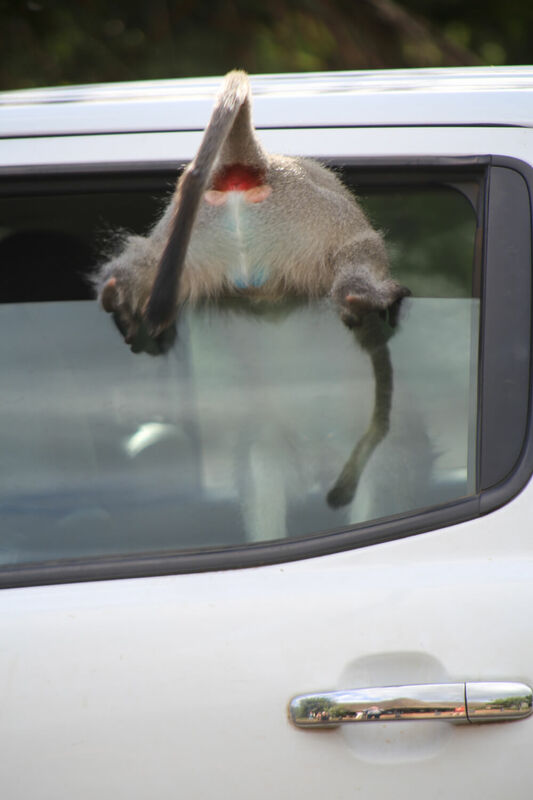 The vervet monkeys here are aggressive as hell so keep your windows rolled up or be prepared to lose any food you leave behind. They happily broke into a park employee’s open window (below) and stole all his biscuits. The most intense moment of our entire day happened at the end of our afternoon in Hluhluwe. We were running out of time but wanted to make a quick detour in search of a lion sighting. Lions we did not find, but we did turn a corner coming face to face with a massive herd of Cape Buffalo. We needed to get through them if we were going to get back to Mpila before the gates closed, but there was the small fact that buffaloes are terrifying and aggressive. We slowly reversed and were considering our options when a park ranger appeared, like Moses parting the Red Sea he parted that heard of buffalo and made it out the other side in one peace. If he could do it, so could we! We psyched ourselves up and softly hit the gas, and ever so slowly and cautiously drove through the buffalo. Each one picked up his head, chewing grass and looking at us curiously. I’ve never been this afraid on a safari, what would have happened if only one had spooked? Let’s not think about that. The warning signs all over the camps warn you of two animals: vervet monkeys and hyena. Well, the hyena that walked by our deck did so peacefully. I could have sworn I heard him say please. The monkeys weren’t polite. They came to play, if you know what I’m saying. I’d heard screams from other tents, expletives ringing out at dinner time. But we had yet to see one of the monkeys and settled into a false sense of security. On our last morning, I forgot to lock the kitchen door for ONE SECOND. I took my tub of yogurt with me and no sooner than my foot hit the deck did a massive monkey come running at me full speed. He hauled past me straight into the kitchen. His little friends were in the trees watching, waiting to be tapped into the action. I screamed and Martin ran into the kitchen to shoo out the huge male monkey that was rummaging through all our bags. The intruder launched himself off of the counter and over Martin’s head, souring over him by mere inches. While this all happened, I was hiding my yogurt inside the tent (because priorities). I zipped up the tent and smugly looked to the monkeys in the tree, thinking I had bested them. Was I ever wrong. Another monkey ran around to the back of the tent, squeezed into an opening to get into the bathroom and entered through the back. Before I knew what was happening he had my breakfast in his dirty little paws and was going back out the way he came. Look at that fucker up there in the tree eating MY breakfast. The moral of this story? NEVER let your yogurt out of your sight. Not even for a second. Those vervet monkeys are a well organized army. They have a plan and they will execute it. Beware of the monkeys, you have been warned. There are two main camps if you’d like to stay inside the park. We opted for the more rustic Mpila camp. If you want a more comfortable experience, Hilltop Camp in Hluhluwe offers more amenities (restaurant, WiFi, bigger shop). Mpila Camp is located in the southern Imfolozi half of the park. It’s strictly self-catering, there is no restaurant here. There is a very limited curios shop so its best to bring your food with you. We actually stocked up in Johannesburg before we drove down. There is a small petrol station if you need to fill up your car. We rented a safari tent and I did not expect the comfortable lodgings that we received. Each tent has its own bathroom, kitchen and dining facilities. The main tent and the kitchen were divided by a deck. We ate dinner on our deck each night and after dark a hyena walked by our tent! He paused when he saw us, as if asking for a bit of my dinner. The camp is surrounded by a high electrical fence that keeps out tall game like elephant and giraffe, but antelope, warthog and hyena come right on in. Always finish your braai before the sunsets or you may have a four-legged “begger” show up demanding a steak. I honestly expected Mpila Camp to be more rustic and was pleasantly surprised. I’d stay here again if we come back to Hluhluwe-Imfolozi. If the idea of no WiFi and no restaurant doesn’t bother you, then reserve Mpila Camp here. The largest camp inside the park is Hilltop Camp in the northern Hluhluwe portion. Hilltop offers more comforts than its southern counterpart, with WiFi and a nice restaurant (with an unbeatable view). While their shop is larger I’d still recommend bringing your food with you if you plan on self-catering here. To reserve one of their chalets or rondavels click here. If you’re looking for luxury Hluhluwe-Imfolozi accommodation, Rhino Ridge is it. It’s set up just on the western boundary of the park. It’s the exact picture of a luxurious safari experience. Their air-conditioned rooms each offer a private deck and the honeymoon villa even features a private pool. They offer complete packages that include full board (three meals a day, high tea and bar snacks included) and two daily game drives. Packages like this allow you to completely let go of control and fully enjoy the experience. Reserve here. For budget Hluhluwe accomodation, Hluhluwe Backpackers is the closest hostel. It’s located just north of the Memorial Gate. 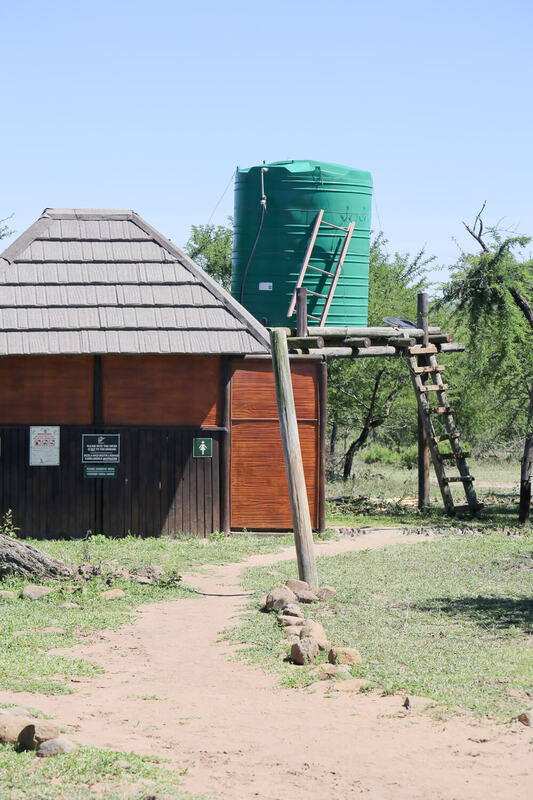 This budget hostel can arrange for guided game drives into the park as well as other nearby activities like the Cheetah Conservation Project. Check rates here. If your time in Kwa-Zulu Natal is limited, you can stay in the more popular St. Lucia and take a day trip to Hluhluwe-Imfolozi. Heritage Safaris organizes excellent day trips into Hluhluwe-Imfolozi from St. Lucia and they also own a beautiful guesthouse in town, the At Heritage House. I’ve gone on a few excursions with Heritage and can confidently recommend them. Monzi Backpackers is another excellent place to stay in St. Lucia. We've actually stayed there twice. It's located on the main street in St. Lucia, walking distance to shops and restaurants.